2 ask a senior student who can reach to get it for us. 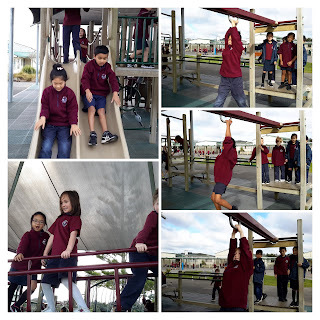 We play safely on the slides and all the other fun parts of the playground that we climb on. Four students from each Year 2 class were fortunate to be able to join a group working with Mr Gover on a Friday morning. They were learning about electronics, wires, batteries, circuits and even made a musical keyboard out of carrots! Here is a link if you would like to see a little of what they got up to. Today we were learning to look carefully with our eyes and notice details in a picture. Then we had to think and give our thoughts and ideas about what we could see. Finally, we had to write 3 things that we were wondering about the picture or situation and we could use our imagination. We enjoyed learning what different scientists do. 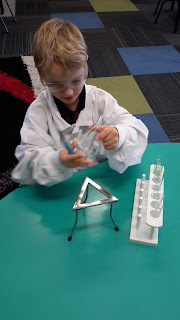 We learnt about the scientific method when recording and conducting experiments. We predicted what would happen when we put different coloured water into containers and linked them with paper towels. Our first experiment didn't work out the way we thought it would! This experiment 'walking water' linked in with our art, learning about how primary and secondary colours are made. We made some more 'magical colour mixes' with our food colouring and milk experiment... no one predicted what would happen there! We learnt about the enamel on our teeth and how it is like the shell on an egg. We soaked an egg in fizzy drink and saw how its colour changed. Then we got to brush it with toothpaste and saw the transformation. We will all remember to brush our teeth! 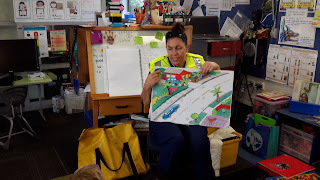 Constable Lorena talked with us about walking safely along the footpath, crossing the road, sneaky driveways and being a safe passenger in a car. We walked along our school footpath and practised crossing the road safely, looking both ways and walking. We have our own sneaky driveways and carparks at school. We looked and crossed safely. We do not usually cross here unless we are with an adult as it is 'out of bounds'. We sat in the car using a booster seat and made the seatbelt go 'click'. No one in our class is tall enough yet to go without a booster seat. 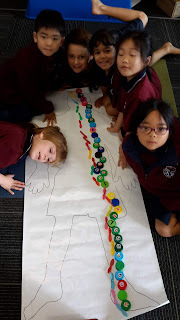 Measuring for maths is fun! When we first started measuring we used unconventional measures. We measured with anything we could find. We knew we had to start at a starting point and use the same sized thing to measure with, and not have any spaces in-between. Well, that was the theory anyway. We also estimated then measured the capacity of different sized containers. Some people decided they would use rulers to measure length. They measured using centimeters. 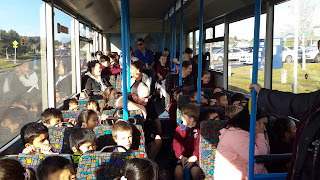 Going on the bus with Room 5 was a fun way to travel. Here we are in front of one of the original old ice cream trucks. After we finished our ice cream it was time for more fun!